So after day 1 of Lollapalooza, where do we go for dinner? In keeping with the Meat-fest theme, we decide to hit up The Silver Palm for the Three Little Piggy sandwich. Now why does that sound so familiar you ask? It's because Anthony Bourdain called it the "greatest sandwich in America" on the Chicago segment of his No Reservations show last year. 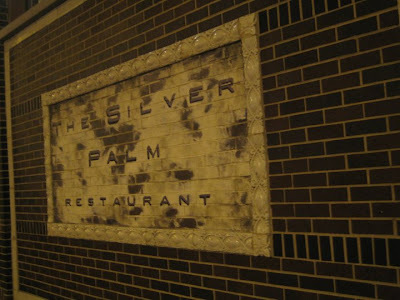 The Silver Palm is basically a retired railway dining car-turned-restaurant, docked near the intersection of Milwaukee and Chicago Avenue. This restaurant serves up one mean sandwich, enough to make any wolf jealous. 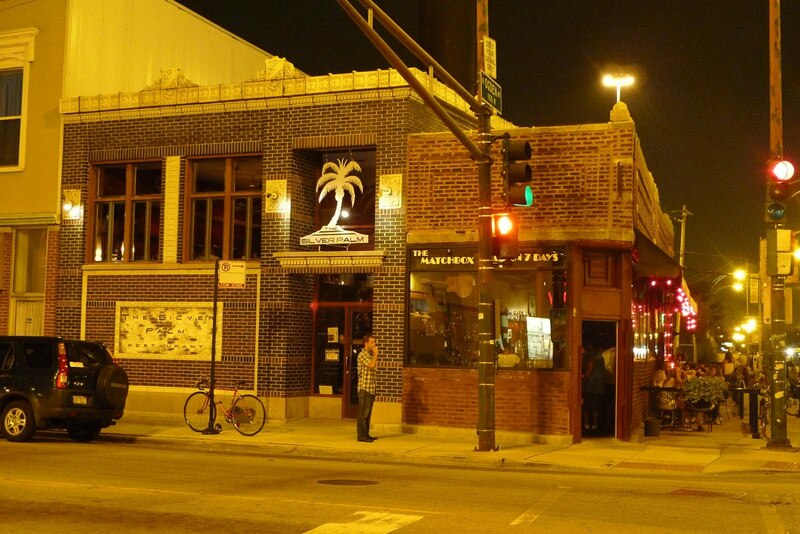 Good thing the Silver Palm is made of brick. Coincidence? I think not. Let me introduce you to the Three Piggies. It is a monster of a sandwich that has white-wine-braised double-smoked bone-in ham with panko-fried pork loin and bacon, plus a fried egg, cheese and onion ring - all on a brioche bun. When you squish it together, it looks like this. I don't think it gets any smaller. It's incredibly difficult to take a bite of the whole sandwich, but it sure was fun trying! It was pretty tasty. 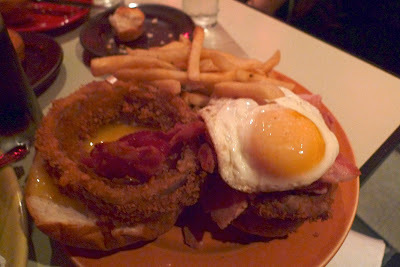 It reminded me of a gigantic breakfast sandwich but with a breaded pork loin and onion ring thrown in for good measure. Susan and I shared one and even then we couldn't even finish it. I also tried their French onion soup, which was alright, but a bit bland if you ask me. I've had better. 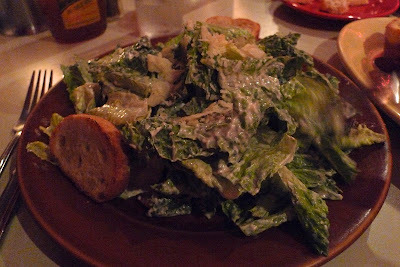 The Caesar salad, on the other hand, was great, but it was a bit heavy on the dressing. I could definitely taste lots of anchovies in this though, yum! This is a cute little diner and a perfect place to come for a late night snack. They close at midnight on the weekends. There's a great little bar next door called the Matchbox, also of the same owner. 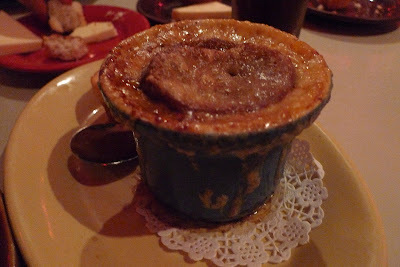 But this has a panko-crusted pork loin in it. 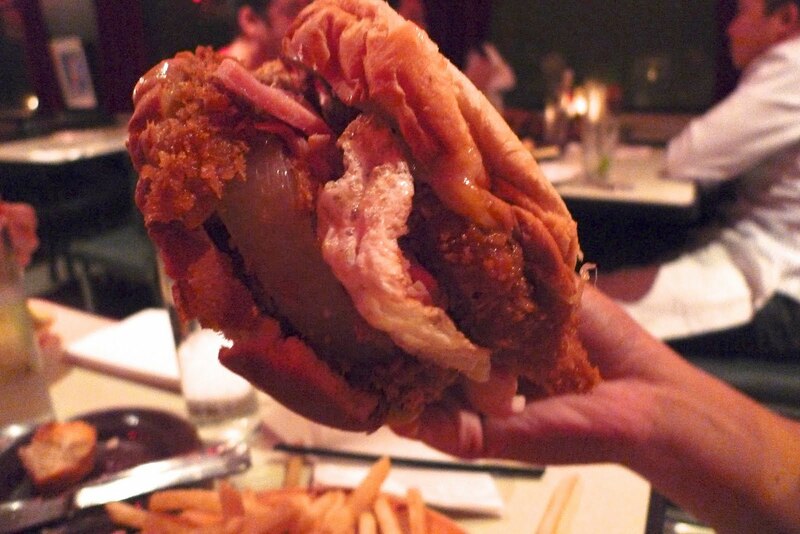 It's like eating a donkatsu in a sandwich with a whole bunch of other meats and a fried onion ring and egg on it. It's monstruous, but tasty. Actually, some donkatsu sauce on this would be great!